This area is hidden behind an illusory wall in the Consumed King's Garden. It appears to be a replica of the Cemetery of Ash, but is shrouded in darkness. The area boss is Champion Gundyr. Defeating him clears the way forward to the Dark Firelink Shrine. The boss here, Champion Gundyr, "was greeted by a shrine without fire, and a bell that would not toll." The boss in the area actually called Firelink Shrine is Iudyx Gundyr, who "was bested by an unknown warrior. He then became sheath to a coilder sword in the hopes that someday, the first flame would be linked once more." Since we find Iudyx dead with a sword in him, but the Champion was already alive, we can surmise that he was impaled by the coiled sword after being beaten by you in the Untended Graves. Therefore, this dark area is in the past, and Firelink Shrine is in the present. Since time is warped due to the Curse, you are able to revisit this previous time. Also, the items you get here aren't in the "light" Graves because you already took them. Similarly, Iudex is the only boss in the game without a soul, because you already took his soul when you defeated Champion Gundyr. "Ahh. Found her, did we? And the black eyes that shimmer within, I see? Tis as if it were but yesterday. We did all we could to spare her from them. Much has happened since. Mayhap I should apprise thee… Of what the thin light of these eyes might reveal to the eyeless Firekeeper. Scenes of betrayal, things never intended for her ken, visions of… this age's end…"
Going by Ludleth's dialog highlighted in bold, it seems that he recognises the eyes of the firekeeper as being from the past, and reveals that much time has passed since he knew that firekeeper. One other NPC that suggests the dark shrine is from the past is the Shrine Handmaiden. 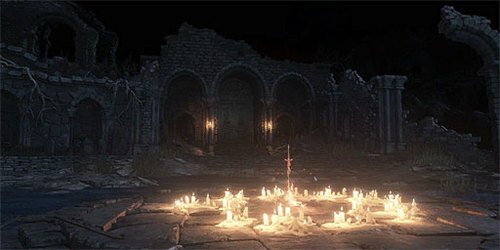 After the player has encountered the Shrine Handmaid in the Untended Graves, the Shrine Handmaid in Firelink Shrine will greet the player differently (the first time), as though she has already met you. Because Prince Lothric refused to link the flame, the future of the world is darkness. Just because you found Iudex Gundyr impaled with a sword and full of rampant humanity, it does not mean you were the one that killed him. Any other undead may have arisen from the graves and tread this ground before, or even visited from another world as a phantom. The description of his Helm says he "was bested by an unknown warrior. He then became sheath to a coiled sword in the hopes that someday, the first flame would be linked once more." The Ashen One is far from unknown; all NPC's seem to recognize you immediately. Gundyr himself is probably cursed as an Undead, like you, so when you slay him, you remove the humanity that corrupted him, thus freeing him to become the Champion he was meant to be. His halberd "is said to never crumble, seeming to suggest that Gundyr was fated to eternal service from the beginning", which supports the idea of his perpetual resurrection as an Undead, like you. Iudex doesn't drop a soul, implying that he wasn't truly dead, and Champion does drop his soul later on. The soul's description reads, "a champion came late to the festivities, and was greeted by a shrine without fire". So, some time passed after he was freed of the Pus of Man in which the flame was extinguished. In this dark version of Firelink Shrine, the Coiled Sword Fragment is found where the bonfire would be. The fragment's description says that it "served its purpose long ago". So, since took the Coiled Sword that Iudex Gundyr was impaled with and placed it in Firelink, this is likely a fragment of that very sword, in the future. You also find the Eyes of a Fire Keeper here, which "reveals to the sightless Fire Keepers things that they should never see", specifically a "world without fire" according to the Fire Keeper at the light Firelink Shrine. She also hints at "thy grand betrayal", implying that you will be the one to usher in the age of darkness. Ludleth elaborates further, saying that "the eyes show a world destitute of fire, a barren plane of endless darkness". Then, he questions if your intent is to be the betrayer the Fire Keeper foresees. Finally, Ludleth explains that giving the eyes to the Fire Keeper will reveal to her "visions of… this age's end…". This age is an Age of Fire, where the Flame is lit. So, since you speak to him in the light Firelink, the Untended Graves version must be the future. In the end, it is possible that the Untended Graves are just a vision of a potential future, where the flame is not linked. This is the real Firelink, and the other one is just an illusion, similar to Anor Londo (in Dark Souls 1). Thus, the Untended Graves is the real world, meaning the fire has nearly faded out, and the world is dark. The "daytime" Firelink Shrine is inaccessible from any other location, whereas the "nighttime" Firelink is directly accessible from the Consumed King's Garden. You simply appear in one, but you can physically walk to the other.